A Stockton-based business which has recorded a 27% rise in turnover and profits during the last financial year is preparing to expand its business in the UK. TaperedPlus, a national leader in commercial and industrial flat roof design and insulation, has achieved similar annual growth figures since it was founded just over four years ago. In anticipation of its future growth, TaperedPlus recently purchased a new head office on Bowesfield Park – with the two-storey open-plan building offering sufficient scope to accommodate an expanding workforce. The firm has now appointed Newcastle-based adviser RG Corporate Finance (RGCF) to help deliver their strategy and ambitious plans. TaperedPlus, which recently appointed a commercial manager to further drive sales, supplies tapered insulation which provides enough fall to allow rain water to drain from flat roofs. The architect-designed service not only allows buildings to meet the latest thermal and acoustic standards – making buildings more eco-friendly and cost-effective – it also extends the life span of flat roofs by preventing damaging pooling problems. TaperedPlus was founded by Robert Vass and Aman Chahal, who have more than 15 years’ experience in the flat roofing industry. It has previously worked on award winning projects including Victoria Gate shopping centre in Leeds, Arsenal Football Club’s training ground and the Feethams leisure complex in Darlington. The company, which previously rented units at Fusion Hive and Durham Tees Valley Business Centre, Stockton, currently employs ten people, together with two external consultants and is currently recruiting an additional two members of staff to strengthen the Design and Administration team. It also has an office in Wolverhampton where its design team is based. Director Robert Vass attributes the company’s increasing success down to the fact that it is independent and not restricted to one single supplier, allowing it to be highly responsive to customer demand. This enables TaperedPlus to deliver more efficient and cost-effective roofing solutions through its ability to source a variety of materials from a wider range of manufacturers allowing for bespoke designs to meet the client’s requirements. Following investment in holistic systems, the company can also respond to customers with a design brief and quote within 24 to 48 hours – significantly quicker than its competitors. Carl Swansbury, Corporate Finance Partner at RGCF, said: “TaperedPlus is a great example of an independent business which has achieved fantastic success over a relatively short period of time. 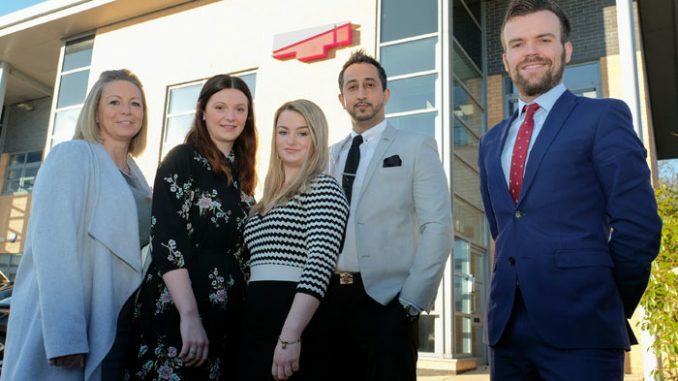 • Pictured above (left to right): TaperedPlus’ Donna Wilson, Hannah Mclean, Leona Wilson, Aman Chahal and RG Corporate Finance’s Carl Swansbury at the new TaperedPlus offices in Stockton.